I’ve been watching the developments with Matthew Jockers’s Syuzhet package and blog posts with interest over the last few months. 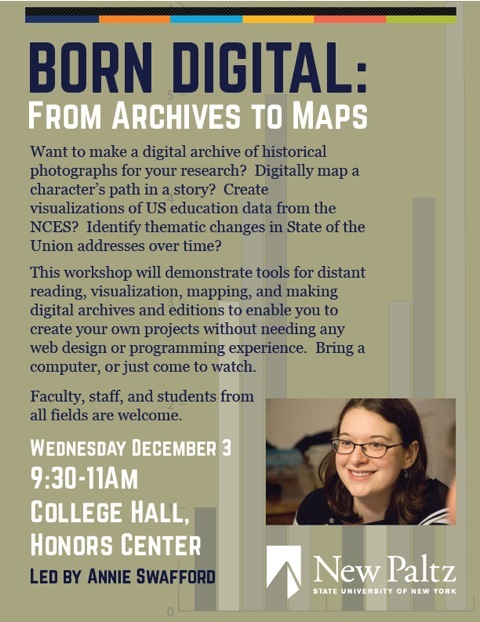 I’m always excited to try new tools that I can bring into both the classroom and my own research. 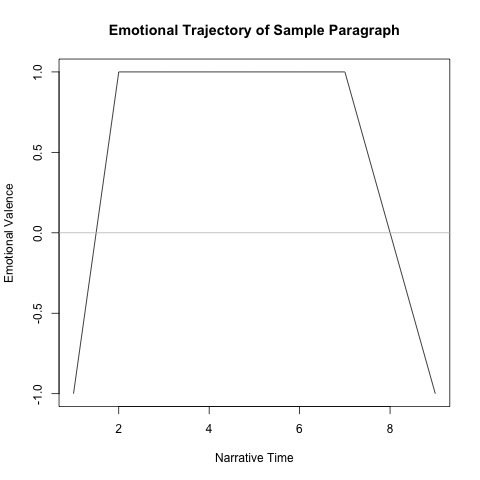 For those of you who are just now hearing about it, Syuzhet is a package for extracting and plotting the “emotional trajectory” of a novel. The Syuzhet algorithm works as follows: First, you take the novel and split it up into sentences. Then, you use sentiment analysis to assign a positive or negative number to each sentence indicating how positive the sentence is. For example, “I’m happy” and “I like this” would have positive numbers, while “This is terrible” and “Everything is awful” would get negative numbers. 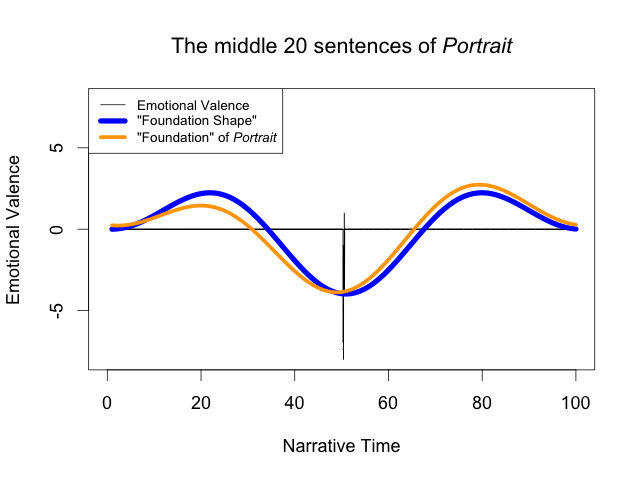 Finally, you smooth out these numbers to get what Jockers calls the “foundation shape” of the novel, a smooth graph of how emotion rises and falls over the course of the novel’s plot. This is an interesting idea, and I installed the package to try it out, but I’ve encountered several substantial problems along the way that challenge Jockers’s conclusion that he has discovered “six, or possibly seven, archetypal plot shapes” common to novels. I communicated privately with him about some of these issues last month, and I hope these problems will be addressed in the next version of the package. Until then, users should be aware that the package does not work as advertised. I’ll proceed step-by-step through the process of using the package, explaining the problems at each step. “It is really of no use carrying on a deception when no object is to be gained by it,” said Mr. Kenge smoothly, “Aunt in fact, though not in law. As you can imagine, these grouping errors are likely to cause problems for works with extensive dialogue (such as most novels and short stories). 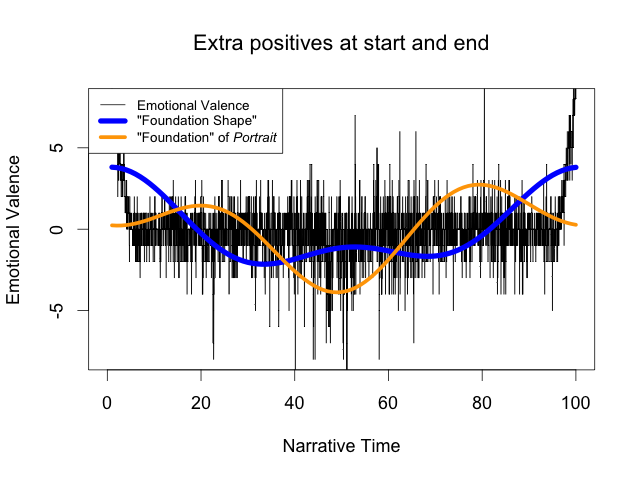 The second step is to compute the emotional valence of each sentence, a problem known as sentiment analysis. 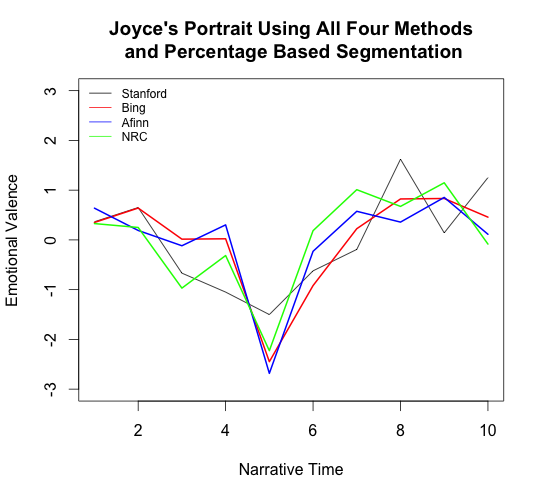 The Syuzhet package provides four options for sentiment analysis: “Bing”, “AFINN”, “NRC”, and “Stanford”; “Bing” is the default, and is what Jockers recommends in his documentation. “Bing,” “AFINN,” and “NRC” are all simple lexicons: each is a list of words with a precomputed positive or negative “score” for each word, and Syuzhet computes the valence of a sentence by simply adding together the scores of every word in it. All three lexicons primarily contain contemporary English words, because they were developed for analyzing modern documents like product reviews and tweets. As a result, words of dialect may produce neutral values regardless of their actual emotional valence, and words whose meanings have changed since the Victorian period may have scores that do not at all reflect their use in the text. For example, “noisome,” “odours,” “execrations,” and “sulphurous” are negative words in Portrait of the Artist but are not negative in Bing’s lexicon. These lexicons also do not provide much nuance: Bing and NRC assign every word a value of -1 (negative terms), 0 (neutral terms), or 1 (positive terms). Thus, the two sentences “This is decent” and “This is wonderful!” both have valence 1, even though the second is clearly much more positive. I haven’t been sad in a long time. I am extremely happy today. But suddenly I’m only a little bit happy. Then I’m not happy at all. In fact, I am now the least happy person on the planet. There is no happiness left in me. I don’t feel so bad after all! According to common sense, we’d expect the sentiment assigned to these sentences to start off fairly high, then decline rapidly from lines 4 to 7, and finally return to neutral (or slightly positive) at the end. This example showcases a number of the weaknesses of this sentiment analysis strategy on very straightforward text; I expect that these problems will be far worse for novels that contain emotion implied though metaphors or imagery patterns, or use satire and sarcasm (e.g. most works by Jane Austen, Jonathan Swift, Mark Twain, or Oscar Wilde), irony, or an unreliable narrator (e.g. much of postmodern literature). 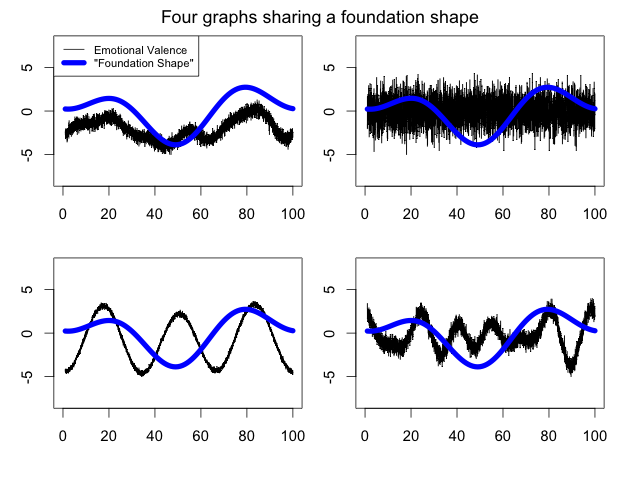 Essentially, the Syuzhet package creates graphs of word frequency grouped by theme (positive and negative) throughout a text more than it does graphs of emotional valence in a text. 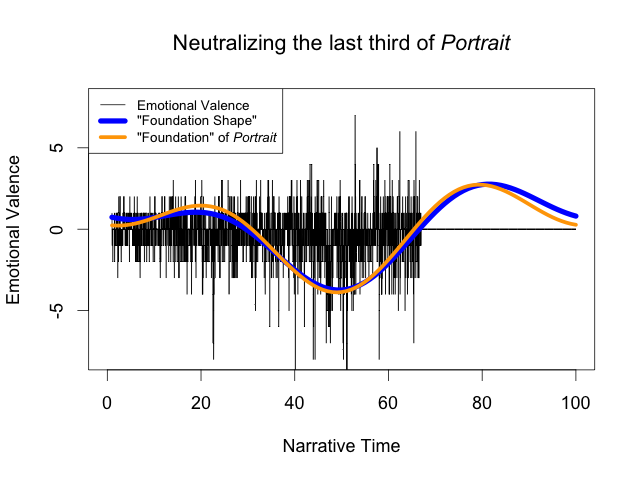 The final step of Syuzhet is to turn the emotional trajectory into a Foundation Shape–a simplified graph of the story’s emotional valence that (hopefully) echoes the shape of the plot. But once again, I found some problems. Syuzhet produces the Foundation Shape by putting the emotional trajectory through an ideal low-pass filter, which is designed to eliminate the noise of the trajectory and smooth out its extremes. 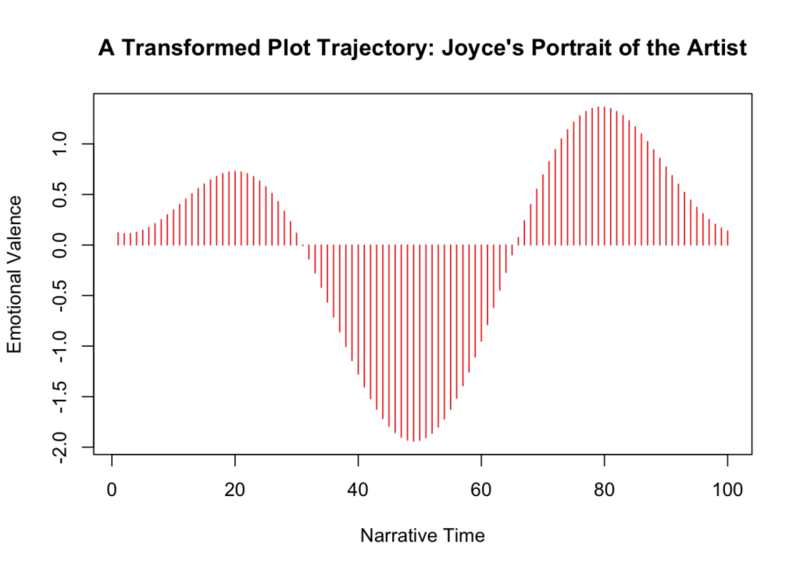 Ideal low-pass filters work by approximating the function with a fixed number of sinusoidal waves; the smaller the number of sinusoids, the smoother the resulting graph will be. 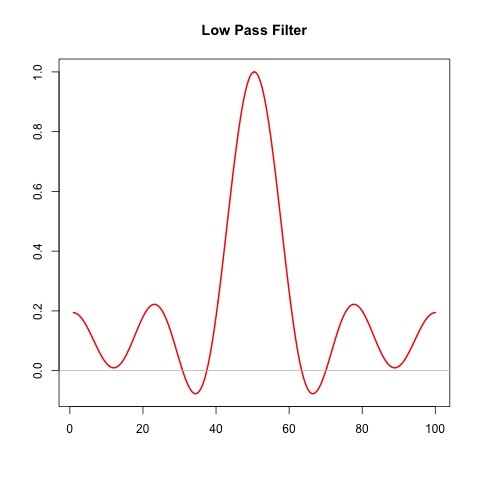 However, ideal low-pass filters often introduce extra lobes or humps in parts of the graph that aren’t well-approximated by sinusoids. These extra lobes are called ringing artifacts, and will be larger when the number of sinusoids is lower. 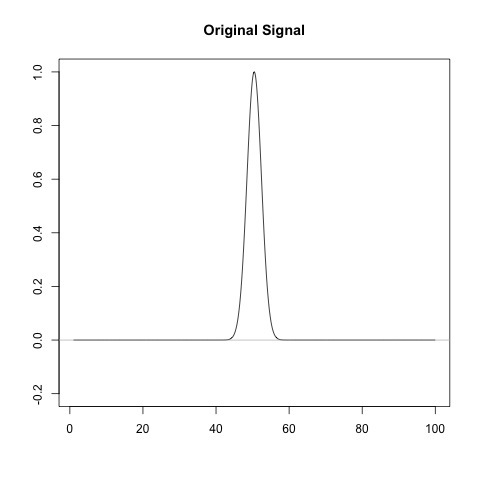 The graph on the left is the original signal, and the graph on the right demonstrates the ringing artifacts caused by a low-pass filter (specifically, by zeroing all but the first five terms of the Fourier transform). The original signal just has one lobe in the middle, but the low-pass filter introduces extra lobes on either side. This is a pretty serious problem, and it means that until Syuzhet provides filters that don’t cause ringing artifacts, it is likely that most foundation shapes will be inaccurate representations of the stories’ true plot trajectories. 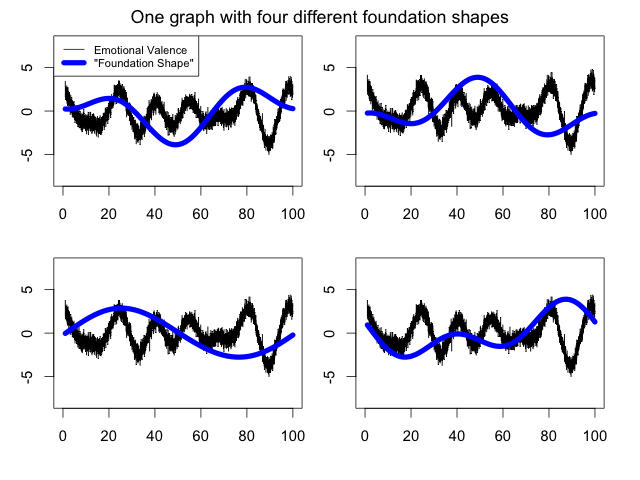 Since the foundation shape may in places be the opposite of the emotional trajectory, two foundation shapes may look identical despite having opposing emotional valences. 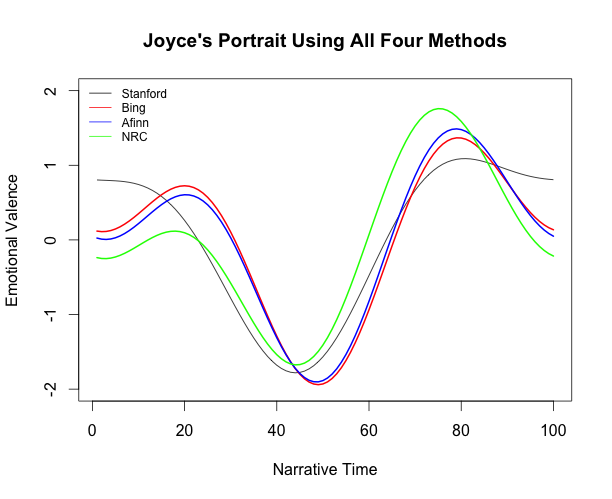 Jockers’s claim that he has derived “the six/seven plot archetypes” of literature from a sample of “41,383 novels” may be due more to ringing artifacts than to an actual similarity between the emotional structures of the analyzed novels. While Syuzhet is a very interesting idea, its implementation suffers from a number of problems, including an unreliable sentence splitter, a sentiment analysis engine incapable of evaluating many sentences, and a foundation shape algorithm that fundamentally distorts the original data. Some of these problems may be fixable–there are certainly smoothing filters that don’t suffer from ringing artifacts–and while I don’t know what the current state of the art in sentence detection is, I imagine algorithms exist that understand quotation marks. The failures of sentiment analysis, though, suggest that Syuzhet’s goals may not be realizable with existing tools. Until the foundation shapes and the problems with the implementation of sentiment analysis are addressed, the Syuzhet package cannot accomplish what it claims to do. I’m looking forward to seeing how these problems are addressed in future versions of the package. I’d like to thank the following people who have consulted with me on sentiment analysis and signal processing and read versions of this blog post. The excerpt doesn’t include quotation marks at the beginning and end because both the opening and closing sentences are part of larger passages of dialogue. This problem was not visible with the sample dataset of Portrait of the Artist, because the Project Gutenburg text uses dashes instead of quotation marks. The Stanford algorithm is much more robust: it has more granularity in its categories of emotion and does consider negation. However, it also fails on the sample paragraph above, and it produced multiple “Not a Number” values when we ran it on Bleak House, rendering it unusable. Other scholars have also been noticing similar problems, as Jonathan Goodwin’s results demonstrate: (https://twitter.com/joncgoodwin/status/563734388484354048/photo/1). For example, Gaussian filters do not introduce ringing artifacts, though they have their own limitations (http://homepages.inf.ed.ac.uk/rbf/HIPR2/freqfilt.htm).